Enter up to 10 Fibonacci percentages (like 0.5, 0.618, 1.618, 5.618, etc). The Fibonacci percentages below 1.0 (like 0.618) will be drawn between the High and Low levels. The Fibonacci percentages above 1.0 (like 1.618, 2.75, etc) will be drawn both above the High and below the Low. This is a huge improvement to the indicator…much more flexible. 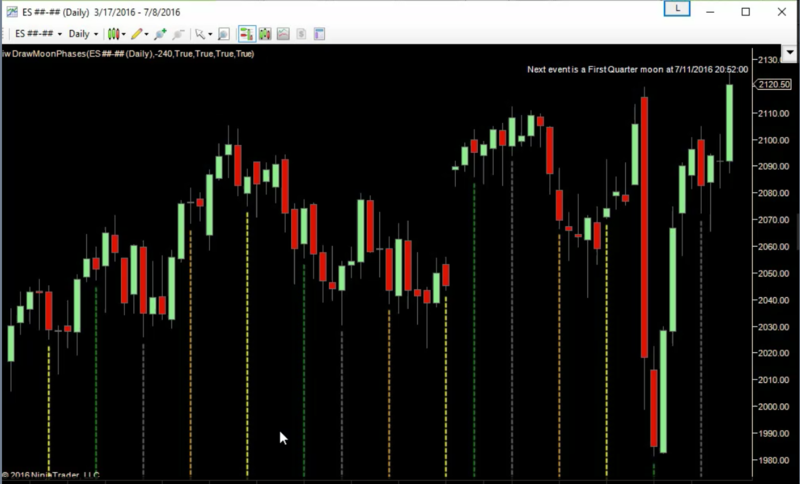 Takes a user defined start time and session length and calculates the high and low range of that period of time on each day, and then calculates several key Fibonacci retracement and extension levels from that high and low. As you scroll back the chart, the indicator dynamically finds the most recent session (high and low) and draws the Fibonacci levels that were in play at that particular time. Many traders believe there is a direct correlation between the primary phases of the moon and the points at which any given, freely-traded market will reverse direction. To say the least, this phenomenon is quite amazing and has nothing to do with astrology and everything to do with astronomy and physics. The cycle of the moon from new moon to new moon is called the synodic cycle. It is 29.5 days in length. This cycle, although invisible, appears to have quite an effect on the markets. The Moom Phase indicator draws a vertical line at each bar that most closely matches the date/time of each full moon, new moon, first quarter moon, and last quarter moon between Jan 1, 2005 and Dec 31, 2020. It comes with a free data file that you can update, containing the time (down to the minute) of each full moon, new moon, first quarter moon, and last quarter moon between Jan 1, 2005 and Dec 31, 2020. "Fantastic for Identifying Opening Support and Resistance Levels..."
Initial Balance Lines were first introduced into the trading community by J. Peter Steidlmayer, the original developer of the Market Profile® along with the Chicago Board of Trade in the mid to late 1980s. Initial balance was defined as the price range resulting from market activity during the first two thirty minute time periods. James Dalton expanded on the Initial Balance concept by identifying it as a valuable tool for identifying the high and low often made in the first 90 minutes of trading after the Open. 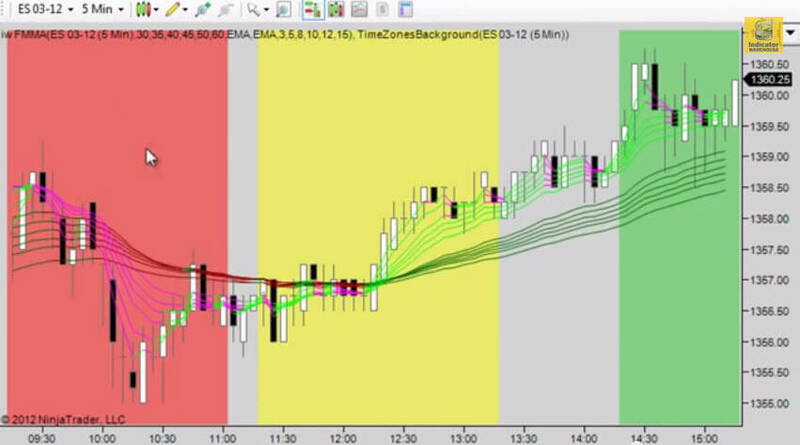 Initial Balance Lines helps you visualize possible trading scenarios and formulate the most appropriate trade strategy and tactics for the rest of the day. Initial Balance Lines with Range Extensions enables you to recognize the range of initial trading balance, its base, and the percentage extensions outside the balance area. 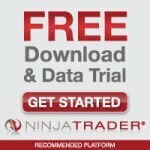 This, in turn will help you visualize possible trading scenarios, gauge your expectations, and guide your trading as the day plays out. Plots the Initial Balance (IB) and 25% extensions from the IB. If you agree that prior levels of Support and Resistance can be historically significant, then the Round Numbers indicator is for you! Human beings have a tendency to favor Round Numbers... it appears to be built into our DNA. You see it in sales and advertising all the time. Being that the Stock Market is still mainly driven by mass human involvement, you will also often see fights taking place at "rounded" Support and Resistance levels. Often you can see that .00 and .50 levels are important thresholds for leading indicies such as the Dow and S&P500. Market Makers tend to buy and sell around these areas, and since they are so easy to remember, day traders use it to also see the "big picture". Round numbers are known to be market inflection points. If an instrument crosses a Round Number point, one can expect a break out continuation move. Here is a common pattern you will see a lot... the first time price trades at a round number you will see a very clear reaction to it. First... price tends to gravitate toward the level, then price will test that level while the Big Money players take out all the stops that tend to reside at primary levels. You will see it test... bounce... re-test, and if a strong trend is in play... eventually, price will break through and move the next Round Number value. Primary goal is to quickly and automatically show the "round numbers" for an instrument. These are the psychologically important price levels. The secondary goal is to let the user add up to 5 of his/her own user-definable price levels. The indicator then provides numerous coloring/shading options at all of these levels. 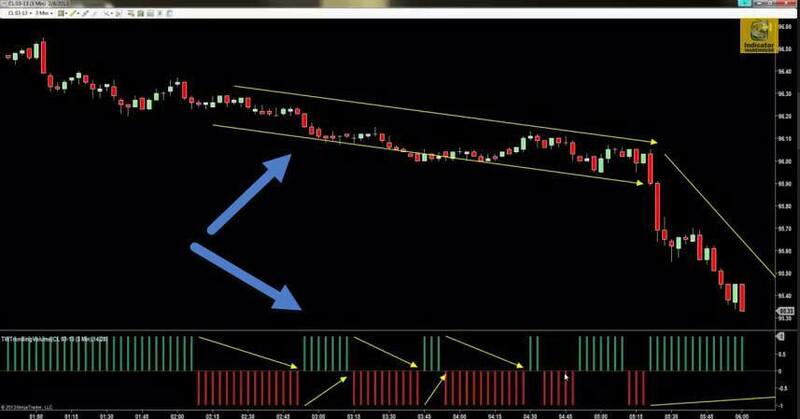 Target Viewer was designed to enable you to instantly see different profit targets on your chart, once you enter a position... without needing to have active positions in play. 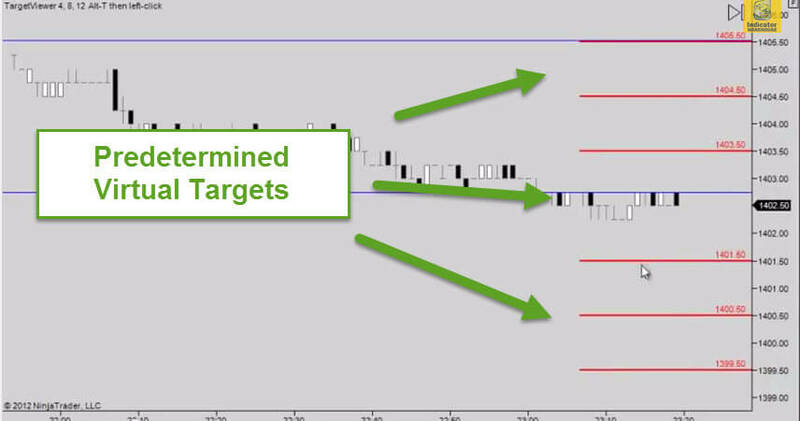 Using the standard NinjaTrader platform, in order to see profit targets preset on your chart, you must have active target positions placed in the market. No need for active positions to be in play. 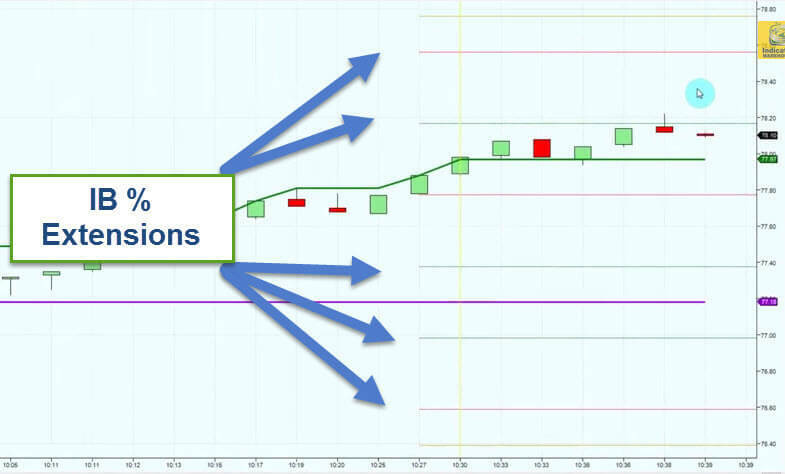 What if you just want to easily see where potential exits are without having to create actual positions in NinjaTrader? With Target Viewer you can! For example, you can preset Target Viewer to draw target lines 4, 8, and 12 ticks above (long) or below (short) you entry. Using Target Viewer, you can easily see those target points and decide whether to stay in the move and let it run, or use the Target Viewer lines as decision points... and you can do all this without being forced into having extra positions in play. Toby Crabel would have loved this one! First, what is a breakout? A breakout is a trading pattern that occurs at a previously established point of support or resistance for a trading instrument. Essentially these lines have become the battle lines for bears and bulls and the more they attack it (more volume that is traded at or around these levels) the more the pressure builds at these prices. When the price pushes past the battle line, there is usually an explosive movement in the direction of the break that builds more and more momentum as it pushes away from the line. That is your breakout trade. Opening range breakout is among the most critical indicators of daily market direction that a trader can employ. An opening range breakout is a trade taken at a designated point below or above the opening range. 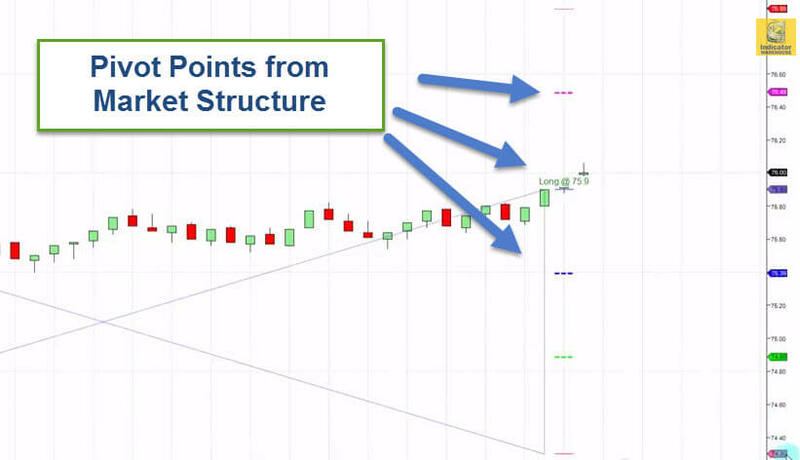 When the defined point is computed, a buy stop is placed that amount above the high of the opening range and a sell stop is placed the same quantity below the low of the opening range. 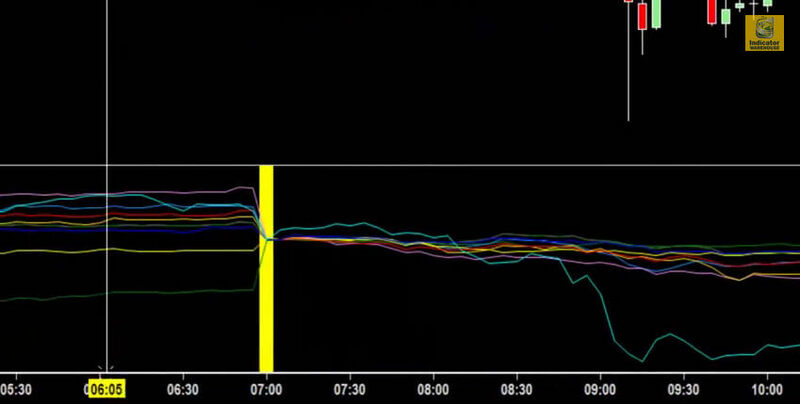 Automatically gathers the High and the Low of a user-specified intra-day time range. User can select the color of the text label, the font, the audio alert file, etc. Remind yourself when to be In and when to stay Out. Color Session Times saves you from having to be constantly calculating if you are within a given favorite trading period. An audio alert will tell you when your favorite times to trade start and end. This will also be shown visibly on your Ninja Trader platform screen. You can configure three different time periods. The Time Zone Indicator will immediately remind you of your specific strategy during that time of the day. 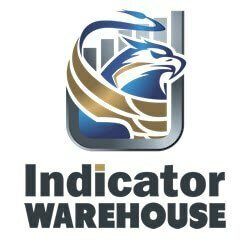 This indicator colors the chart background a specific color between the specified times. This is handy when you want to highlight certain times of the trading day (i.e. News events, Lunch hour, etc.). You can have multiple times colored at the same time, and all different colors. It is granular down to the minute, and colors can be user selected. Audible alerts at the start and end of a defined session. Set times and colors for three distinct time periods. Control the opacity of color on the chart. The Fibonacci percentages above 1.0 (like 1.618, 2.75, etc) will be drawn both above the High and below the Low. This is a huge improvement to the indicator...much more flexible. 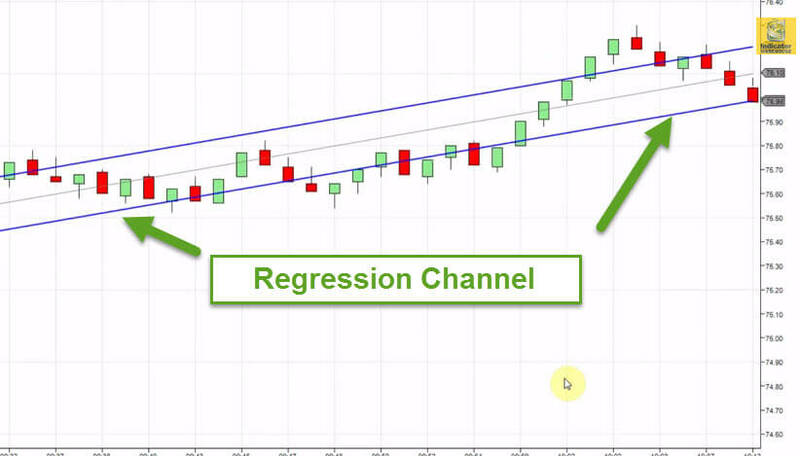 This indicator automatically draws Regression channel lines for specified period and Deviation Size. It will always keeping the Regression Channel flush with the rightmost bar of the chart. 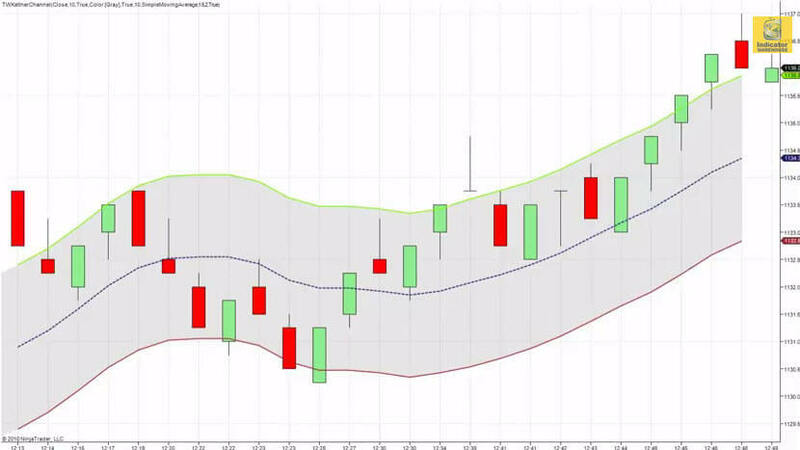 Upper, lower and middle channel price levels accessible by other NinjaTrader Strategies or Indicators. 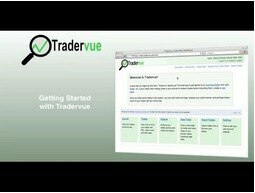 We took a great trading tool and Made it even Better! In the typical version of Keltner Channels, the central line is usually a 20-period Exponential Moving Average. Our version gives you many more moving average options (see Key Features). The upper and lower bands are drawn at an equal distance from the central line. The distance is defined as a specified multiplier of the ATR. All these can be modified, if so desired. “Length” is the number of bars to be used in calculation of the central line. “Offmultiplier”is the distance to define band expansion from the center line. “ATRLength” is the number of bars to be used in calculation of the ATR (average true range of “X” bar). A strategy for trading the Keltner is to regard a close above the upper line as a strong bullish signal, or a close below the lower line as strong bearish sentiment, and buy or sell with the trend. Trending Volume gauges if the market is trending or choppy. Use this indicator to detect reversals... when the indicator moves from red to green, it is often the start of a trend. Reveal Opportunity by Comparing up to 10 Instruments on the Same Chart! We all know the markets are hard to predict. But some of the things that are predictable and have the power to ramp up your trading are often completely overlooked. The Percent Change indicator is one of them. BasePeriodType Minute, Range, Volume, Tick, Second, Day, Week, Month, Year The indicator needs to pull in the data of the other symbols, and this parameter specifies what type of bar data. 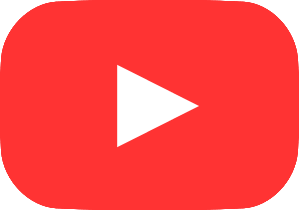 BaseTimeFrame This is a numerical value that helps complete the input for the BasePeriodType. FirstOfMonth, FirstOfYear. In combination with KeyTime, this parameter helps to completely specify when the percent change calculation is reset to 0. OutputMultiplier – The output of the calculation is a ratio of the Current Price / Price At Reset time. The user can change the result of this calculation by factors of 10, so that the results are in a more convenient and readable format. The moment that the user adds their first Symbol into the parameters Symbol01, 02, etc...the indicator creates a text-file in the “My Documents” folder of the user and adds these Symbol names to that file. The file is named “NT_Instruments.txt”. This text file contains all of the dynamically added instrument symbols and expiration dates. The user can edit this text file using a simple text editor. There they can add new symbols, or delete expired ones as they so desire. This is a quick way to maintain the symbols and keep they up-to-date. Alternatively, the user can delete expired symbols through the Indicator Dialog box itself. This is accomplished by adding a “*” (Shift-8 on most keyboards) character in the beginning of any symbol they want to delete. For example, say they enter “*ES 06-11” in for the Symbol01 parameter. The indicator will then delete “ES 06-11” from the NT_Instruments.txt file. 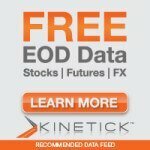 Detect Trend Weakness and Reversal Points! The standard momentum technical analysis indicator measures the rate of change in closing prices and is used to detect trend weakness and likely reversal points. The standard momentum technical analysis indicator measures the rate of change in closing prices and is used to detect trend weakness and likely reversal points. It is often overlooked because of its simplicity. This is a mistake because it is one of the best day trading indicators in existence. Our Momentum Multicolor Line and Bars measure the amount that an instrument’s price has changed over a given time span and expresses it as a red-green oscillating line or paint bar tool. 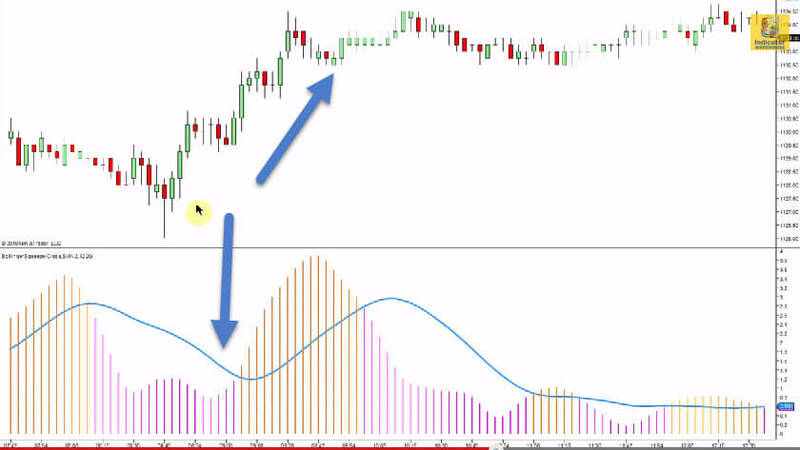 There are two ways to use the Momentum Multicolor Line and Bars indicator: 1. 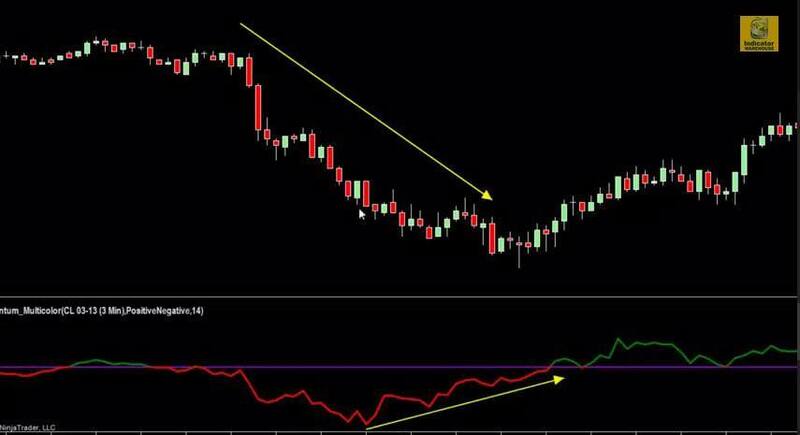 You can use the Momentum Multicolor Line and Bars indicator as a trend-following oscillator similar to the Moving Average Convergence/Divergence (MACD). Buy when the indicator bottoms and turns up and sell when the indicator peaks and turns down. 2. You can also use the Momentum Multicolor Line and Bars indicator as a leading indicator. This method assumes that market tops are typically identified by a rapid price increase (when everyone expects prices to go higher), and that market bottoms usually end with rapid price declines (when everyone wants to get out). As a market peaks, the Momentum Multicolor Line and Bars indicator will climb sharply and then fall off — diverging from the continued upward or sideways movement of the price. Similarly, at a market bottom, Momentum will drop dramatically and then begin to climb well ahead of prices. Both of these situations result in divergences between the indicator and price. Indicator visualizes when the Momentum oscillator changes condition. This works very nicely in conjunction with trend based indicators. Ongoing plot forms an oscillator that moves above and below 100. Indicator will also paint the candlestick bars according to momentum change. One color when line is above the Zero line and one color when line is below the Zero line. One color for upward line movement and one color for a downward movement.